ThetaHealing® can be done by phone or in person. The client’s permission is required for a successful healing; the client is in control of their healing. 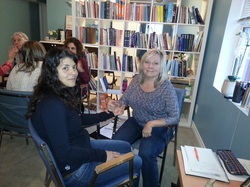 The practitioner discusses with the client what he or she would like to change about their life. This sparks the beginning of the session and gives the practitioner a starting point. Energy testing is used to confirm changes. The practitioner utilizes the Theta brain wave to intuitively witness the healing of the client. Because everything is energy... it is easy to clear emotions such as anger, sadness, fear, and guilt. These stored emotions can cause stress, pain or disease in the body. During the session, clients feel many different things. Some clients feel many changes, while some say they feel very little; but the consensus is that they feel different when it is over. A typical session is based on each individual's goals and progress--how much time, emotional energy, and financial energy they choose to invest in their own personal transformation. In being aware of my connection to the 7th Plane of Existence, I scan the client's energy field and body to see/hear/ sense what is going on for the person. The scanning also allows the beliefs to be triggered from the sub-conscious mind to the surface, or conscious mind. This assists in finding the source of why a person may be holding onto a disease, condition, or life situation. Sometimes, if it is a specific condition that is needing transformation, the change can be instaneous as there may not be beliefs attached thus that concern is complete in just one session. Other times, people support their issues/projects and transformation by having regularly scheduled sessions which includes deeper belief work changes until their individual goals have been met. It is up to the client how they would like to proceed. My role as the facilitator is to hold a sacred and safe space for the client, to set the direction for the healing, to be the observer/witness of the change in a non-judgmental way, and to support the client in understanding and releasing the pattern of beliefs and programs. I use presence, through direct questions, in guiding the person to their fears and programs through the Four Level Belief Work. This allows a quickening so a true and permanent change will occur. Each belief changed or a Creator's teaching witnessed, is a healing in itself. ThetaHealing® includes many amazing techniques to support the change of stress and conditions and to foster immunity and healing. Be clear of what issues you want to work on during the session. Jot down when the condition or situation might have started. If it’s possible to connect with your feelings around the issue, see how this situation or condition has made you feel, and how it might be serving you (what are you learning from it) both negatively and positively to be able to rapidly accelerate the pace of your session. The more you can feel, the more you can heal. It is helpful to have a list of medications and/or supplements that are taken and amounts of each along with any cleanses you may be on. It is important to be fully hydrated with water (not teas, coffee or soda), because this will allow the energy testing for belief work to be clear and strong. During most sessions, energy testing will be needed and several methods can be used depending whether it’s in person or though a phone or skype session. If you are doing the session by phone or skype, make sure you know where north is in the space you'll be in. The duration of a Theta Healing session is usually between 1/2 Hour and 2 Hours, and the number of sessions required depends on the issue you would like to work on. Most issues can be addressed in one or two sessions, but some may take longer. To get ready for a Theta Healing session it’s helpful to drink plenty of water before the session to make sure you are well hydrated, as this will assist you with energy testing. You do not need to do anything in preparation for the session, other than being ready to let go of the things that are no longer serving you in all areas of your life and allow yourself to Co-create with Creator of all that is, THE LIFE YOU WANT NOW.